Monsoon-influenced phytoplankton community structure in a Philippine mangrove estuary. Canini, N.D., Metillo, E.B. and Azanza, R.V. 2013. Tropical Ecology.54(3), 329-341. Water depth, tide monsoon/weather related changes (like suspended, solids, salinity and dissolved nitrogen) significantly affect the abundance and diversity of the microscopic plant assemblage in Panguil Bay, Norther Mindanao, Philippines. Two distinct assemblage that oscillate with the northeast and Southwest Monsoons were observed: 1) deeper, more saline waters with low abundant but high diversity group located at the mouth of the bay and 2) shallow, less saline water with high abundant but low diversity group at inner parts of the bay. To conform or not to conform, that’s is the genderqueer question: Re-examining the lesbian identity in Bernal’s Manila By Night. Cantor. 2012. Kritika Kultura, No. 19, 90-114. The classic 1980s film Manila By Night, directed by National Artist for Film Ishmael Bernal, highlights the different narratives of Manila residents who come around and about at night. While some may be seedy, some may be high and mighty, but all are downright human, and real. What’s interesting in this film is that it also put into the limelight the narratives of marginalized people in Philippine society, namely the gay and lesbian population. With characters that embody this community, the film has humanized more the lives of queer people as seen on this film. However, the identity of the lesbian might have been misconstrued in this film since it might have been responding to the dictates of its own space and time. While the film points to an obvious character identification of the woman-loving-woman as a butch lesbian, I posit that this certain characterization may have not been the accurate depiction that the film was actually trying to convey. From many interactions, character nuances and intersections with other characters, I posit the notion that the butch lesbian here may have been trying to be a “nonconformist lesbian” and instead may have been aiming to become a genderqueer androgynous lesbian character. The relevance of this study is to trace that gender-nonconforming women-loving-women may have been present in Philippine cinema all along, but have always been surpassed to subscribe to a more “fitting” description based on gendered lesbian stereotypes of the butch-femme dichotomy that is more “popular” in society. Texting Styles and Information Change of SMS Text Messages in Filipino. J.J. Cabatbat, G.Tapang, International Journal of Modern Physics C., 24(2), 2013. This paper presents a method of determining the style combination used by a texter using the changes in the unigram and bigram frequencies from the original text to the SMS message. The change in the information due to texting was also investigated and the result was explained in terms of coding process. Water quality and Aedes larval mosquito abundance in Caloocan City, Philippines. Sia Su, G.L., Beronilla, A., Yao, K.B.. Dengue Bulletin Vol. 36, 2012:175-181. The aim of our study was to examine the water quality of the breeding habitats of Aedes larval mosquitoes from randomly selected communities and determine the relationship of water quality parameters in the breeding habitats to the abundance of the larval mosquitoes. Water samples obtained were assessed for dissolved oxygen, pH, conductance and salinity. Mosquito larvae surveys were conducted in all breeding habitats. Results showed that dissolved oxygen is the best predictor variable associated with the abundance of the mosquito larvae. Dissolved oxygen in the water in breeding habitats plays an important role in the abundance of Aedes larval mosquitoes. Growth and survivorship of juvenile corals outplanted to degraded reef areas in Bolinao-Anda Reef Complex, Philippines. Marine Biology Research. 8 (9), 877-884, 2012. Coral propagules were produced through sexual means (from eggs and larvae) in ex situ conditions. These were then outplanted to degraded bommies in Bolinao-Anda Reef Complex. This is the first study to utilize sexually-derived coral propagules for restoration of degraded reefs. With high short-term survivorship of outplanted juvenile corals, this approach in coral populations enhancement has a great potential in improving the health of ailing coral reefs. Link to the article: http://www.tandfonline.com/doi/abs/10.1080/17451000.2012.682582. Social Capital and the Martial Law Technocracy: The Making and Unmaking of a Power Elite. Kritika Kultura, 20: 69-94, 2013. This paper attempts to show how the Philippine technocracy during the martial law years utilized its social capital (used interchangeably with cultural capital) to become a potent economic bloc in society only to see it gradually depleted. Led by then Prime Minister and concurrent Finance Minister Cesar E.A. Virata, this bloc consisted of key senior economic officials who were closely associated with IMF-World Bank policies. Their social capital was founded on their family and educational backgrounds, paving the way for their acquisition of the technical expertise required by the business community and later, by government. The social capital of this bloc grew due to their ability to access foreign loans, gain international support, and function as a deterrent to corruption. 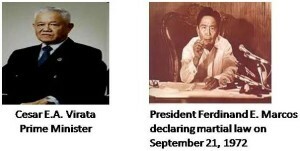 Marcos, however, proceeded to undermine this bloc’s capital by doing the following: 1) limiting the Virata faction to the economic sphere and making sure it was not “politically-threatening”; 2) “factionalizing” the technocracy resulting in non-Virata technocrats pursuing their own projects; and 3) and nurturing crony capitalism and corruption through Mrs. Marcos and his “chief cronies” to the detriment of the Virata faction’s economic policies. To a certain extent the Virata faction was able to minimize this with the support of the IMF/World Bank and the political and economic crisis of the early 1980s gave further impetus for this. But this could not be sustained because of the inability of the Virata faction to get the needed loans and the withdrawal of US support for the Marcos dictatorship. 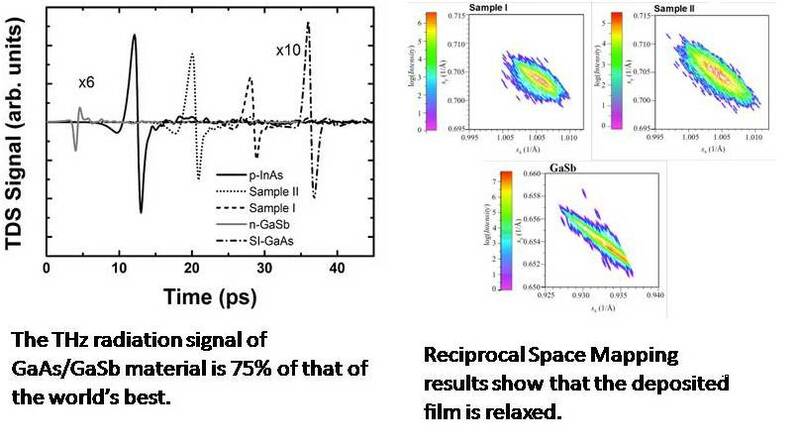 Intense terahertz emission from molecular beam epitaxy-grown GaAs/GaSb(001). Journal of Applied Physics, 112 (12): 123514-1-123514-5, December 2012. Gallium arsenide semiconductor layer was grown on top of gallium antimonide through a semiconductor growth technique called molecular beam epitaxy. The combined materials (heterostructure) emitted ultra-fast electromagnetic waves or terahertz waves. 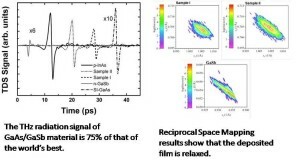 The terahertz signal was 75% as much as the signal of the world’s best terahertz emitter, p-doped indium arsenide.The terahertz signal was attributed to different sources of electric field in the materials: surface field, built-in field at the interface of the two semiconductors, strain, and piezo-electric field.The surface and interface field strengths were inferred by studying the energy-band-versus-position profile of the materials. The piezo-electric field was calculated using the equation relating piezoelectric field and elastic constants.Different characterization techniques were used on the material to study its light emission property and degree of strain or crystal quality.There is ongoing need to search for viable, alternative emitters of terahertz waves. The application of these emitters ranges from biomedical to ultrafast spectroscopy to law enforcement. 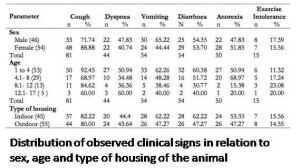 Microscopy and Serological Assessment for Heartworm Infection in Cats in Makati, Philippines Showing Clinical Signs of Dirofilariosis. Iranian Journal of Parasitology, 8 (1): 53-59, Jan-Mar 2013. Dirofilaria immitis, commonly known as canine heartworm is transmitted by mosquitoes and can infect animals as well as man.Canine species is the natural host source for human dirofilariasis. However, the potential of feline species as a source of human infection cannot be discounted since D. immitis infection is now also considered as a potential causative agent of heartworm in feline species. It was found out that the presence of heartworm in canines increases the likelihood for feline heartworm infections as well. Moreover, reports of increasing numbers of feline heartworm infections in other countries were documented. On the other hand, the sole report of heartworm infection in feline species in the Philippines was published late 1965.Since the last known report of feline dirofilariasis was approximately forty years ago, the study therefore aimed to determine the current status of heartworm infection in cats from Makati, Philippines using three different diagnostic tests namely acetone microfilaria concentration method (Ohishi test), DiroCHEK ® antigen test and WITNESS® HW antigen test.The most commonly observed clinical sign was coughing while exercise intolerance was seldom seen. Age groups ranging from 1 to 4 years old exhibited majority of the clinical signs whereas the 8.1 to 12 years category had the least. 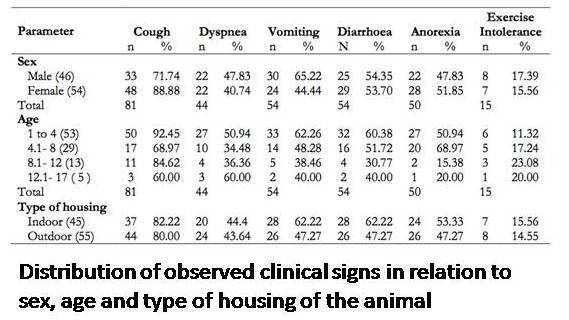 The results from the different detection methods employed revealed that none of the animals were positive for circulating microfilaria and no detectable levels of heartworm antigens were obtained.The results of the study advocate that the presence of associated clinical signs are not outright indicators of feline dirofilariosis and may be indicative of the rarity of heartworm infection in cats in Makati, Philippines. The health of Mananga River in Cebu was assessed between February and December 2006 using selected physicochemical factors in combination with macroinvertebrate composition and diversity indices. Freshwater macroinvertebrates are aquatic animals such as the young of insects, worms and snails (Fig. 2). These animals have no backbone and can be seen with the naked eye. They live in the water for all or part of their lives, so their survival is related to the water quality. The richness of these aquatic animals was used to provide an estimate of river health. The aquatic insects made up 58.6% of total abundance followed by the gastropods (single-shelled mollusks) at 39.9%. Among the orders, the mayfly nymphs were the most abundant (47.6% of total). At the family level, the hornshell, a gastropod, was the most persistent and the most abundant followed by an insect family, the small square-gill mayfly. There were more organisms in the upstream and midstream, both during the dry and rainy seasons. However, signs of increasing deterioration of river water quality were observed based on the analyses of the water physiochemistry and the results of the biological index. No sampled portion had good or fair water quality; the upstream and midstream portions came out moderately polluted, while the downstream (Fig. 1) portion was moderately to highly polluted.